This pair of highly unusual and original salts come from Madras, India and date to the latter part of the nineteenth century. 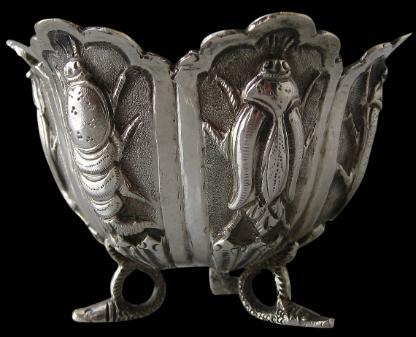 Colonial Indian silver salts are not uncommon but this pair is exceptional for the subject matter and for their quality. Each stands on three small feet shaped as snakes. The salts rise to elaborately scalloped rims. Around the side of each are six panels repoussed with a large tropical bug! The bugs fill the panels and are against finely tooled backgrounds. The sides of the salts are double-walled so that the interiors are smooth and highly suitable for holding salt, pepper or mustard. This double lining is also unusual and not frequently encountered in other similar Colonial Indian salts. 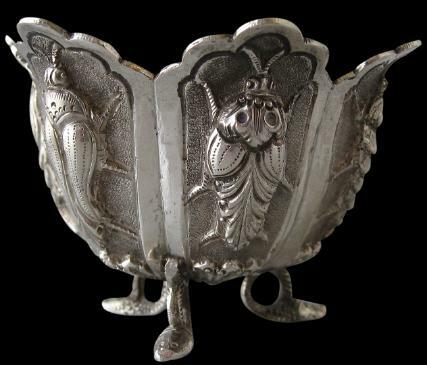 Overall, these whimsical and amusing items are fine examples of Madras silver-work which otherwise normally features ‘Swami’ work of often indifferent quality. No other similar salts have been published to our knowledge.